The Royal Horticulture Society's Award of Garden Merit goes only to plants that meet a minimum of the following requirements: "excellent for ordinary use in appropriate conditions, available( at nurseries and garden centers ), of good constitution, essentially stable in form and colour, and reasonably resistant to pests and diseases". The AGM list is updated periodically to ensure that these are still the best of the best. "Awards are only made after assessment by an RHS forum of experts appointed by the Society to assess that particular trial. Each forum has its own area of expertise, and draws upon the experience of a wide range of experts, including nurserymen, specialist growers and well-known horticulturists. This assessment must then be ratified by the relevant Plant Committee. The trial and assessments usually take place at one of the four RHS Gardens but can also take place at one of our partner gardens, National Trust gardens or commercial nurseries." For more information and to see all of the RHS AGM winners visit https://www.rhs.org.uk/plants/trials-awards/award-of-garden-merit. This famed healing plant is often used to promote the rapid healing of burns, cuts, scrapes, stings, etc... A clump forming succulent producing a rosette of thick fleshy gray spotting green leaves that may be topped by spikes of tubular yellow flowers. Multiplies readily. 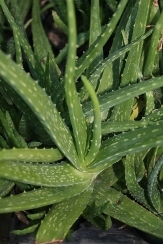 Juvenile aloe leaves can be used medicinally. Item # 1110. This famed healing plant is often used to promote the rapid healing of burns, cuts, scrapes, stings, etc... A clump forming succulent producing a rosette of thick fleshy gray spotting green leaves that may be topped by spikes of tubular yellow flowers. Multiplies readily. Juvenile aloe leaves can be used medicinally. Item # 9240. Beautiful, silvery-pink, small to medium size, double peony flowers are produced beginning as early as October and continuing well into January. 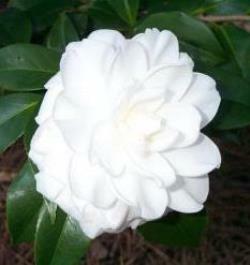 Ave Maria Camellia develops into a nicely rounded evergreen shrub about as wide as it is tall. Item# 9106. Tall spikes of lavender and purple flowers are held on sturdy stems above the beautiful rich glossy green foliage in late summer and fall. 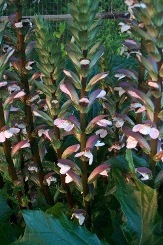 An easy and hardy perennial. The leaf pattern was used extensively in Greek architecture. Bear's Breeches is a slowly spreading perennial that lends its form, flowers, and foliage to the shaded garden. This perennial needs good drainage and average moisture to perform well. Item# 3003. Two-toned semi-double flowers are dark pink at the outer edges fading to a light pink toward the center creating a beautiful effect. 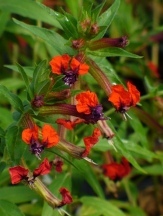 The medium sized flowers are born in mid-season on this vigorous old garden favorite. Item# 9528. White tubular blooms emerge from tall, velvety, purple calyxes on dense flower spikes from late summer to fall. This is considered to be the normal color form for the species. 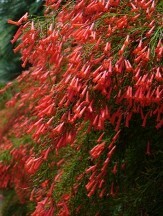 Soft velvety medium to gray-green foliage. Mexican Sage bush is a drought tolerant, sun and heat loving reliable clump forming perennial that is considered deer proof. Item# 10284. The Bird of Paradise produces exotic and unusual, tropical looking orange, blue, and purple bird-like flowers that are perfectly designed to allow Sunbirds to perch on the tips of the blue petals which opens the flower and provides access to their rich nectar. Here in the US we get to enjoy Hummingbirds enjoying their bounty. The large glossy blue green foliage of the Bird of Paradise is arranged in attractive symmetrical fans that provide architectural interest even when the plants are not in flower. 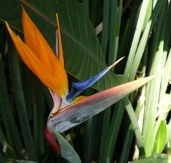 The Bird of Paradise is an easily maintained evergreen container specimen or grow it in the ground where hardy. Item# 1214. Showy deep violet-purple, fragrant spikes, to 8" long, are held at the ends of the arching, woody stems. 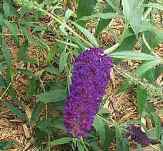 Black Knight Butterfly Bush is an exceptionally free-flowering shrub, producing the intensely deep purple, fragrant flowers from spring until fall. An excellent choice for butterfly gardens as well as providing nectar for a host of other pollinators including hummingbirds. Black Knight, an RHS Award of Garden Merit winner, is still one of the most strikingly colored and popular of all Buddlejas grown today. Item# 322. 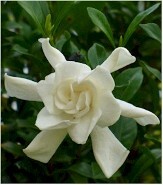 Grows To: 4-6'H x 4-6'W and larger in mild winter climates. 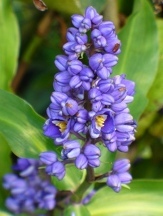 Deep purplish-blue blooms are borne in 6" spikes in summer and fall. 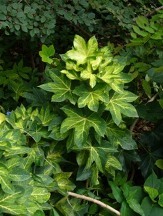 Tropical glossy green ginger like foliage is borne on stiff fleshy stems. Item# 326. 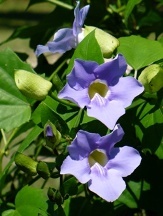 3" purplish-blue trumpet-like blooms with a white to light yellow throat are born in spring and summer. 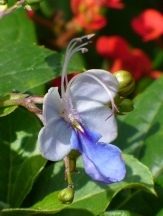 The Blue Sky Vine is a vigorous and hardy tropical vine that can be grown as a tuberous rooted, summer flowering perennial into zone 8B. 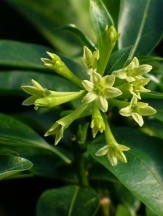 In frost free areas this heat and sun loving vine is evergreen and can flower throughout the year. The large flowers attract bees and other pollinators. Enjoy the Blue Sky vine as a container plant where not hardy. Item# 1108. Spikes of 2" vivid fuchsia tubular fuzzy flowers emerge from dark colored calyxes and are held atop the dark green, glossy rounded foliage from spring to fall on this compact growing Salvia. Buchanan's Sage is an excellent choice for containers or the garden where it is sure to attract both hummingbirds and butterflies. A popular and easy to grow beauty that is now considered to be very rare if not extinct in its native habitat of Mexico. Item# 9857. 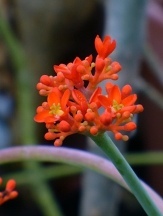 The Buddha's Belly Bush or Gout Plant produces long lasting clusters of bright reddish orange flowers that open a few at a time on sturdy stems held well above the large tri-lobed, rounded tropical foliage. The base of the plant develops into a swollen caudex providing the Buddha's belly. 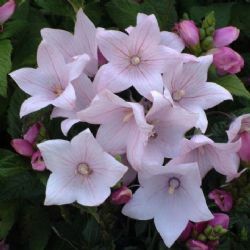 These are easily grown and rewarding plants that flower throughout the warmer months and will often flower sporadically through winter on established plants. 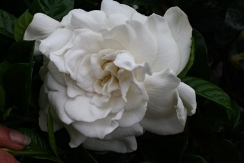 Its drought tolerance lends it to a well-drained soil and is an excellent choice for the porch, patio, or even indoors. Item # 339.